As a consumer, it’s more than likely that you own at least one item made by Jabil. Headquartered in the U.S., Jabil is one of the world’s most technically advanced manufacturing solutions providers, working with most major consumer brands across more than 100 facilities in 28 countries. 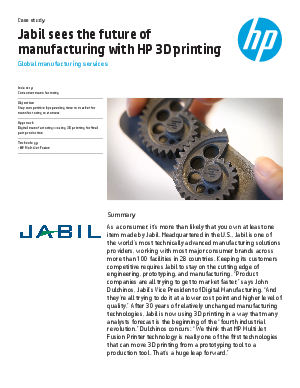 Keeping its customers competitive requires Jabil to stay on the cutting edge of engineering, prototyping, and manufacturing. Producing parts on a 3D printer that meet or exceed traditional manufacturing’s cost, quality, and speed gives Jabil’s customers a new edge in the ultra-competitive consumer products market—a benefit that’s especially important to Dulchinos.